Right after the development of the F-86A, it was decided to use what was learned from it to make an interceptor. The other programs were not going well and the USAF really needed something to combat the expected horde of Soviet bombers that were the main fears of US war planners. So North American developed a Sabre with a larger fuselage to hold the radar equipment, additional fuel and an afterburner. Originally called the XF-95, like the F-84F, there was no money for a new plane, but there was for an 'upgraded' version of one already in service. Hence the F-86D. Thanks to a lot of commonality in components, the F-86D was a pretty quick build. Too quick as things turned out as the folks supplying systems (such as the radar electronics) could not keep up. At one time there were 320 airframes awaiting critical pieces before they could be delivered. 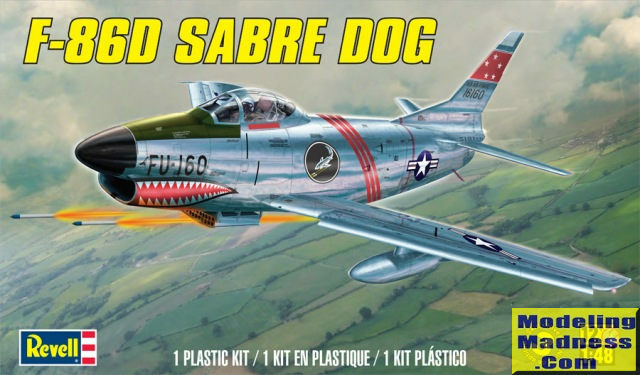 Eventually things were caught up and the 'Sabre Dog' went on to a longish career with the USAF. It was later fitted with a slatted F-40 wing and incorporated the SAGE system. Under this guise, it became the F-86L. These planes saw most of their service with the ANG, though some regular USAF units also flew it. Many D models were upgraded to L specs. The D, though firing only rockets, also saw some use with foreign rockets. The K model was equipped with four 20mm canon and was built by Fiat for NATO. This particular kit is an early F-86D without the braking parachute. The parachute was installed on all F-86D-45 aircraft and subsequent. This was brought about when it was discovered in 1953 that aircraft sent to the Far East were unable to be used safely due to the shortness of runways. It was decided in late 1953, that all earlier F-86Ds without the parachute were modified during a specially ordered IRAN (Inspect And Repair as Necessary) overhaul schedule. This allowed aircraft to be pulled from squadron use as soon as possible in order to get all F-86Ds up to a single standard. 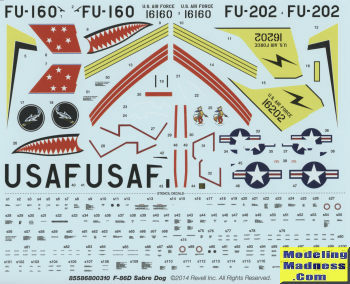 What this means to the modeler is that they need to be sure that any aftermarket decals used needs to be matched to the plane and the time frame in order to be completely accurate. Many of us will gleefully ignore this little problem and happily build the plane as we like, but you do need to know this. Serial number buffs will want to know that F-86D-45 serials start with 52-3898 so any that are earlier and prior to the IRAN overhaul that added the parabrake, will be applicable for this kit. This particular overhaul was started in July 1954 and all aircraft so modified by September 1955 under Operation Pull-Out (the USAF loves its special operation names and probably has one for when the general goes to the bathroom!). 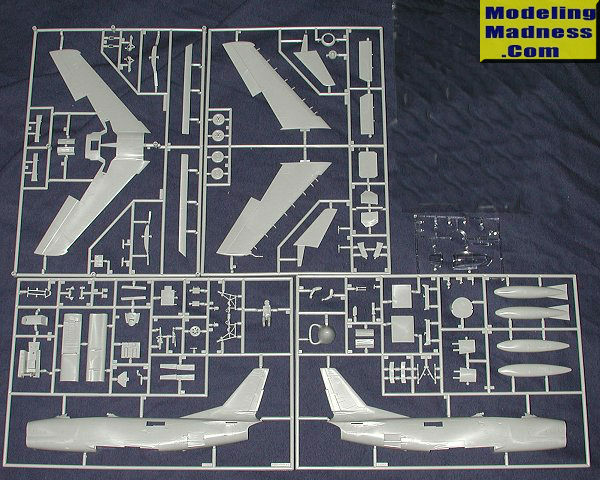 Those wanting to build an F-86L will have to wait for a wing upgrade kit or do some heavy modifications. Part of the F-86L package was a slatted 6-3 wing, unique in the USAF to the F-86L. Not only was the chord broadened, but the wingspan was increased as well. A few other bits of interest. One is that Revell used the F-86D at the USAF Museum for a reference. Unfortunately, that one is a D-5 used by a test unit with a few non-standard items. One is that the trim tab on the rudder is oversize. A bit of sand paper will cure some of that, but it needs to be reduced in height as well so if you are wanting to be really accurate, you'll need to fill in some of it as well. There are a lot of photos of the back of F-86Ds on the net that can help. Note also that starting with the D-10, (that would be aircraft 50-518), the trim tab on the rudder was eliminated, but reappeared starting with the D-30 (aircraft 51-5945). For those interested, the box art plane is a D-30 and the other a D-35 The other is that the kit has the D-1 instrument panel. Very few D-1 variants were built and the panel was changed early in D-5 production. The kit itself is pretty much the same as from the ProModeler boxing except without the tow tractor. A nicely done cockpit, a need for weight in the nose and a fairly nicely done intake. There are inserts in the body for the early and late fuselage side engine cooling intakes, but you won't be using the later ones on a round tailed Sabre. Markings are provided for two aircraft. The one on the box art is with the 75th FIS in late 1953. The other, for which you use the yellow markings, is with the 31st FIS. No date given. Decals are nicely printed and while the yellow looks too light to my eyes for insignia yellow, they may well darken when placed on the kit. Note that both side drawings show the oversize trim tab, but as mentioned, that is not correct and should be reduced in both the vertical and the horizontal to be more accurate. There are lots of aftermarket decals and resin upgrade sets out there if you are so inclined to use these. Despite the few little glitches, none of them are deal breakers and the kit builds into an excellent model. I have several of the various boxings in my stash and do plan to eventually build them. I suggest you get one and give it a go. The North American Sabre by Ray Wagner. Doubleday, 1963.